Samsung Electronics finally revealed Samsung Galaxy S4 Mini, a highly portable, lightweight and low-cost version of world's best-selling smartphone today, the Galaxy S4. Ahead of Samsung Premiere 2013 GALAXY and ATIV launch in London on the third week of June, product specifications already announced. Samsung Galaxy S4 Mini is the successor of S3 Mini launched last year. Korean mobile giant is targetting the mid-range market with the S4 Mini introduction. Powered by Android 4.2.2 Jelly Bean platform software, S4 Mini users will still find the phone innovative though some specs were stripped down. The GALAXY S4 mini allows users to capture important moments with an 8-megapixel rear-facing camera and 1.9-megapixel HD front-facing camera. While the Samsung Galaxy S4 weigh 130g, it's younger brother is 107g light weight. It has a dimension of 124.6 x 61.3 x 8.94mm (H x W x D) compared to S4's 136.6 x 69.8 x 7.9mm. It means that the GALAXY S4 mini is easy to carry and operate with one hand. Though compact, the GALAXY S4 mini also boasts powerful performance, equipped with a 1.7GHz dual core processor that allows users to quickly and easily perform data intensive tasks. A bit lower than 1.9GHz clocking performance of S4. 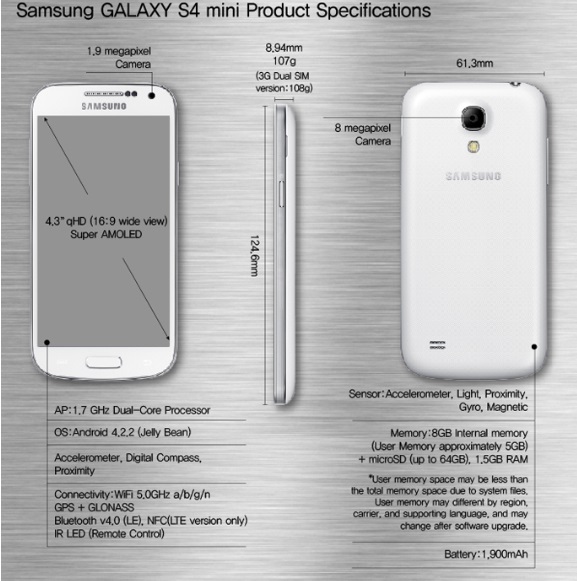 According to Samsung Electronics, the GALAXY S4 mini will be available in two colors, White Frost and Black Mist. Commercial availability of the GALAXY S4 mini supporting either 4G LTE, or 3G HSPA+ or 3G Dual SIM, will be determined by market. 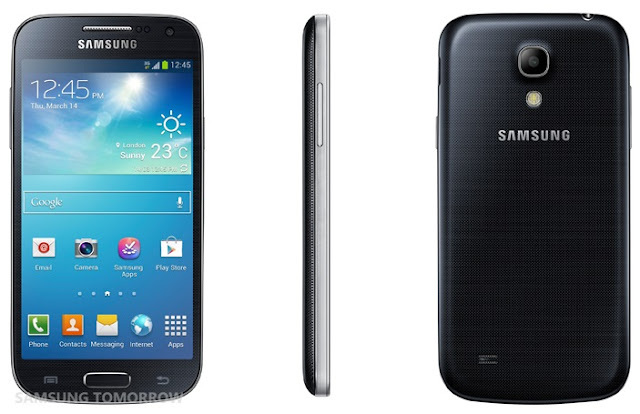 The official worldwide release of the new phone as mentioned will be announced at the Samsung Premier 2013 in London. Samsung Philippines has no word yet in the pricing and availability. But of course, the price is expected to be "half" of the Samsung Galaxy S4. June 25, 2013 Update: The expected suggested retail price (SRP) of Samsung Galaxy S4 Mini is about Php23,000. August 31, 2013 Update: Samsung Galaxy S4 Mini I9192 (Dual-SIM) is now available in online stores: Php16,480 via Kimstore and Php16,900 via DBGadgets. Meanwhile, S4 Mini I9190 is also available and priced at Php20,380 via WidgetCity. TheSummitExpress will update this page for the exact price, release date or availability in the Philippines. Boomark this page now or Follow Us on our social media channels.